I recently spent a beautiful late summer afternoon at Terhune Orchards with my daughter, sister, and a friend. It proved to be a perfect outing for our little group. The orchard has wine tastings, friendly barnyard animals, and pick-your-own fruits, flowers, and pumpkins, among other things. Family owned and operated since the 1970s, this charming farm and vineyard is located in Princeton, New Jersey, with a relaxing country atmosphere for both grown-ups and kids to enjoy. Our first stop was in the old barn for the wine tasting. The winery and tasting room are located inside a cool historic 150 year old barn. We each chose 5 wines from their list to try. Each one was unique and delicious, with the standout for me being the Apple wine, which I could see being absolutely ideal on a crisp fall evening. Another favorite was the Chambourcin, a dry red wine with a hint of cherry. Harvest Blues, another fruit wine, was unlike anything that I’ve tried before, with a sweet blueberry flavor. It is so tasty that one could easily mistake it for juice, and it actually took the Silver medal last year in the NJ State Wine Competition. The other ladies loved the Front Porch Breeze, a semi-sweet blush wine, and Cold Soil White, another semi-sweet with light fruity flavors. The experience itself was wonderful, thanks to the friendly and knowledgeable staff members who made us feel right at home. It was hard to choose a favorite, and we were kindly given the opportunity to take another taste of any that we were considering taking home with us. At the end of the tasting, we came away with 2 bottles of Cold Soil White, souvenir glasses, and the intention to return again someday soon. The tasting room is open Thursday through Sunday, from 12 to 5 pm. After sipping on the delicious local wines, we headed into the Farm Store to grab a snack. In here, you are met with a colorful array of fruits, vegetables, and other sweet treats. My senses were on overload with the variety of fresh goodies that we had to choose from. We loaded up on juicy red tomatoes, apple cider donuts and donut holes, cold apple cider, and delicious little focaccia breads. We took them out to a nearby picnic table for a quick picnic lunch. After finishing up our snacks, we wandered over to see the barnyard animals. Here you’ll find sheep, goats, chickens, horses, and a precious pony. My 3 year old enjoyed playing on the old tractors and inside the kid-sized farmhouse, which serves as a little playground. Depending on the season, you can also do pick-your-own fruits and flowers. 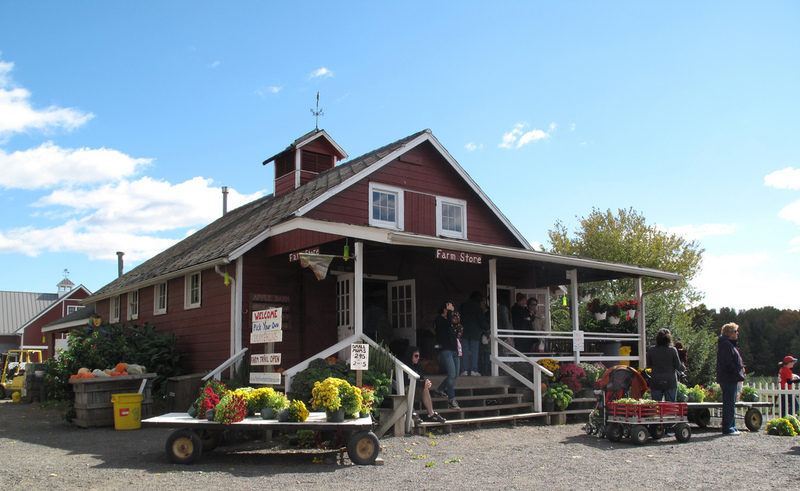 In the fall, the orchard has a pumpkin patch, wagon rides, and a corn maze. Terhune Orchards was a great find for us. Not only did we get to enjoy the peaceful country setting, but we also got to taste some delicious local wines. It’s a terrific place to come with the whole family, in any season.